The number of university students committing suicide has nearly doubled since 2000, new figures today show. The figures, released by the Office for National Statistics, comes amid growing alarm at the issue after ten students took their lives in just 18 months at Bristol University. 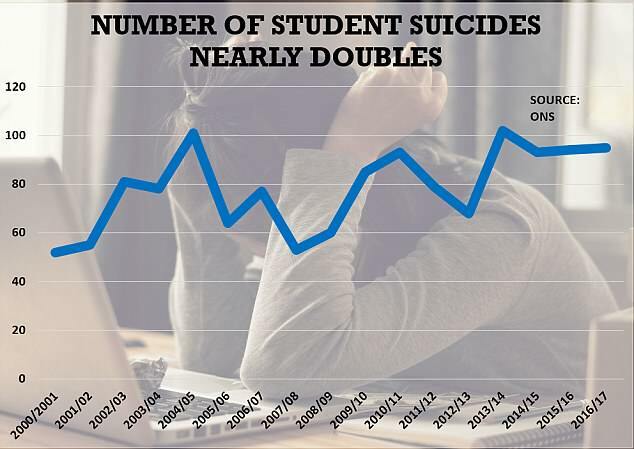 Some 95 student suicides were recorded in the year ending July 2017 – nearly twice as many as the 52 noted in 2000/2001, according to the ONS. Over the 16 years which experts looked at, some 1,330 students took their own lives, according to official records. Around twice as many men studying at higher education institutes have taken their own lives to own compared to women over the same period. On average, students committing suicide were just 26 years-old.